The range of goldfish colors and possible combinations make these fish quite attractive, especially to hobbyists. Goldfish are hardy, inexpensive, and a good choice when you're looking for variety. They come in dappled versions of black, white, gold, and orange, and there are many types of goldfish with different looks. You can even keep many of them in the same tank because they get along well. If you go to a pet store or to a goldfish specialist, you can expect to see these different colors available for purchase. Have a look around several shops before you commit to a few fish, because you have options. This is a rich goldfish color that's often considered arresting and exotic. A red goldfish stands out best among dark green foliage and aquarium ornaments. Red goldfish are also an interesting combination in a tank with lighter gold or calico goldfish. Orange goldfish are one the most common goldfish colors available for purchase, but they are far from boring. As you will soon see, the traditional "gold" fish is available in different varieties, such as fantail, common, bubble-eyed and lionhead. The orange-colored fish are also nice to combine with white if you are a breeder. A "white" goldfish? They definitely exist! You will find white goldfish look different under different types of aquarium lights, so consider when you'll be looking at the tank more often - during the day or at night. It's difficult to see the onset of certain diseases on a predominantly white goldfish, so it is recommended that white goldfish fanciers keep at least one black goldfish in the tank along with the light-colored ones. Black or bronze goldfish colors are exciting because they often turn up in unique varieties like the bubble eye goldfish or the black moor. These fish are regularly used to add sophistication and interest to a tank, and their darker-colored bodies make them good monitors for diseases like ich. You'll be able to see signs of scale sickness on a darker fish first, so it is worth investing in a few. If you have difficulty choosing between any of the previous colors, no problem. Perhaps a bi-colored or a calico goldfish is the one for you. 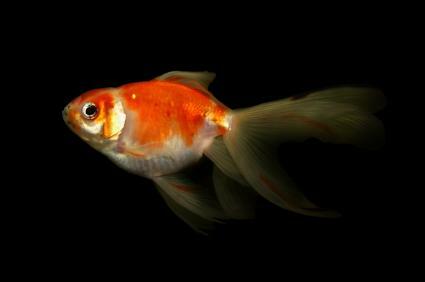 Calico goldfish fish have random speckles of red, orange, gold, black or bronze on a white background. Bi-colored goldfish have a combination of two colors, such as red and white or red and black. All things considered, both types of color combinations are quite striking, and they make a nice visual addition to a tank with multiple goldfish. Besides choosing the color of your new pet, you'll have to pick the variety. These are just a few popular goldfish varieties you'll encounter during your search. Common goldfish: This fish is related to the Prussian Carp, only varying in color from its cousin. 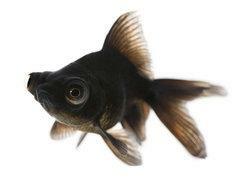 Black moor: This black goldfish's protruding eyes makes for a great conversation piece in a tank or aquarium. You might see this kind of fish labeled as the "popeye" or "dragon-eye" fish in specialty shops. Bubble eye: Large fluid-filled sacks under the eyes make this goldfish worth checking out. It's like the bloodhound of the fish world, with its droopy-looking expression. Butterfly tail: The dramatic tail on this goldfish makes it look elegant and interesting. Fantail: View fantail goldfish colors from above for the ideal effect. Shubunkin: This calico-colored goldfish is one of the most interesting varieties in terms of color. As you can see, goldfish colors definitely aren't limited just to gold. With some luck at the pet shop, you can find attractive fish that attract attention, yet don't need nearly as much care as a salt-water fish. Once you enter the colorful world of goldfish, you should be able to find a few cuties that tickle your fancy.